Some people will remind this name and this scan...yes,he is back,with more grunge and fire. 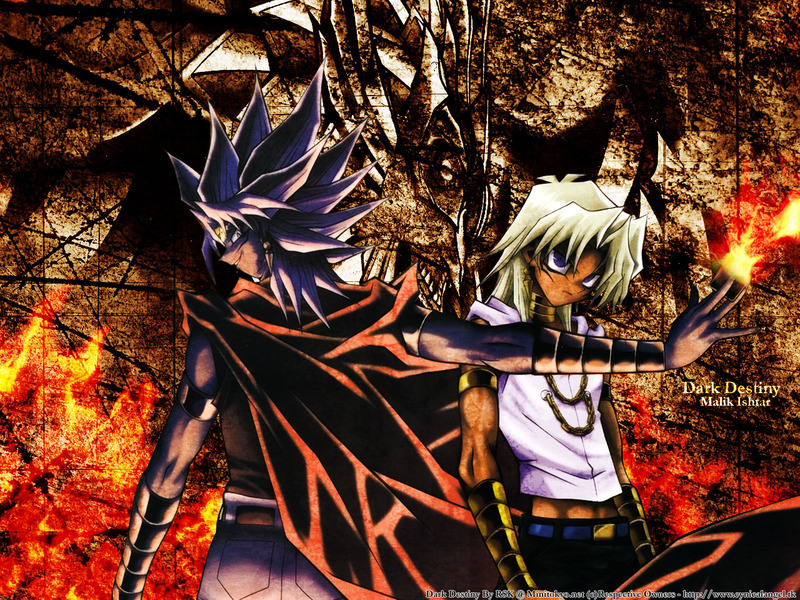 Well,this couple of days i found myself working in my own webpage and when i was working in the Yugi-Oh category i remember that the Malik wall is one of my all time favs,but for a lot of reasons i cant make all the things that i have in mind that time,so some hours later i start to work with the 2nd version. Some textures,brush work,and a lot of different layers to reach an old egipcian wall look with the Ra image in the back,then i think...Malik...Ra...fire ^o^!,so i have to find some good fire tutorial,and this is the result it look fine(or i think so ^^),but please dont say: Hey rebel the fire in the card look odd,i know that the blend between the card and the flame dont look real u.u. Anyway,i hope u like it . Nice nice ^^ tho i havnt rily been watching the anime, i tried playing its card game ^^ fun . anyway good job on the textures. The bg is good too, nice grunge effects !! great work! ! ! ! Wow, it's reallie a treat to see a well made Yu-Gi-Oh wallie from U, Rebel-san! 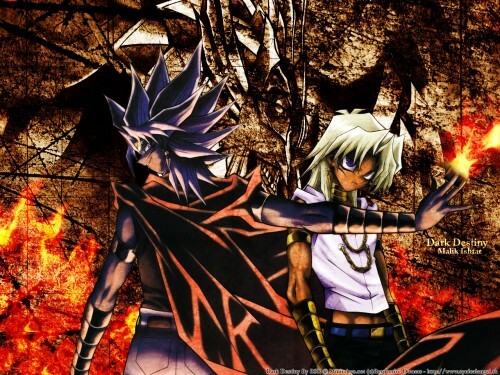 The fiery grunge designs with the faint picture of RA on the BG blends real nice and the dark and light versions of Marik are so cool, can't believe I said that! o_0 Anyhoo, great work! Holy Grunge!!! i like the scan expression on them... bg and scan merged perfectly!!! Not too fond of all the vertical and horizontal lines that you've got all over the place in the bg, imo it takes away from the great grunge work you've done. The fire could've been brought out more, as it seems to be drowned out a bit too much by the grunge. Aside from that this is well done, you've set quite the evil and dark mood with this one! i like the wall , but i think the scan needed to merged more with the bg. I feel it's a bit rough to match the bg. Nice wall Rebel. The bg is really cool. Great work on it, the fire looks cool too. I agree with calisqo, the characters could blend into the background more smoothly, but its already decent. Very nice work on this! *in love with the textures* XD~<3 Great work. woah!!! the bg is damn cool!!! the grunge style and those fire is really nice and attractive!! not to mention the scan is really good too!! arigato for the awesome work rebel-san! great !! I love the layout !! the color of it also. thanks for posting !! Yu Gi Oh Rules !! Malik looks so hot the flames in the background are so cool the wing dragon of ra looks so powerful! This is wicked cool, I love the effects, keep it up! Well bai bai! Hope to see you around! Whoa, cool, long time I haven't seen any cool wall of Yu-Gi-Oh!